The manor and estates of Little Easton, later Easton Park, were granted to Henry Maynard, Lord Burleigh’s private secretary in 1590. He was knighted in 1603. The house, Easton Park, was built in 1597 and burnt down in 1847 when it was rebuilt by Hopper. At the date of the present work, Easton Lodge was in the possession of Charles, Viscount Maynard (1752-1824) who inherited the peerage in 1775 and succeeded his father as 5th Baronet in 1792. He married but had no children so the estate was inherited by his nephew. The house later achieved notoriety as the home of Daisy Maynard who married Francis Greville, later Earl of Warwick, in 1881. She was famous as a socialite who had several affairs with powerful men including Edward VII and was the inspiration for the music hall song ‘Daisy Daisy’. Although her main residence was Warwick Castle, she retained Easton Lodge and created lavish gardens and a private zoo at the house. Much of the Estate was sold off in the 1890s and again in 1919 and 1920. 1500 acres of woodland and farmland remained in the Maynard family until it was sold in 2004. 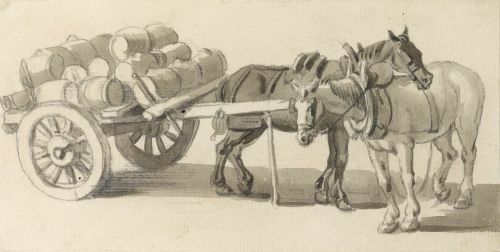 36.3 by 51.6 cm., 14 ½ by 20 ½ in. 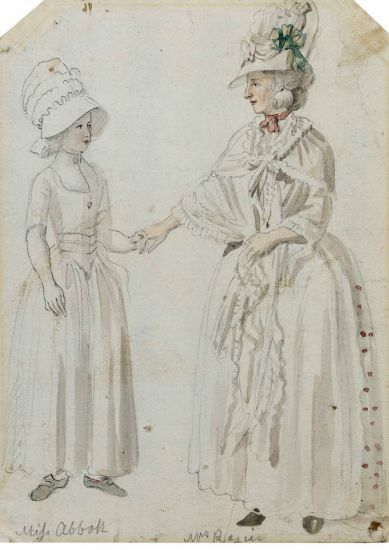 Stylistically this watercolour dates from the 1770s and this has been confirmed by Professor Luke Herrmann. 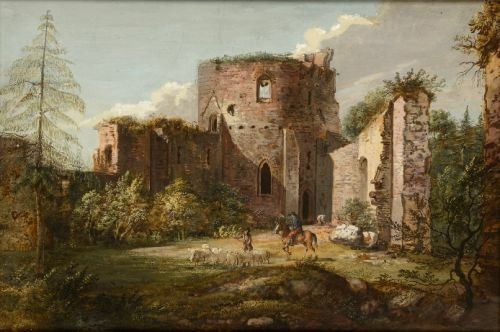 Sandby visited Wales three times in the early 1770s. His first visit was in the summer of 1770 when he was invited to stay at the family seat of Sir Watkin Williams Wynn at Wynnstay, Denbighshire, about four miles east of Llangollen, and he returned for six weeks the following summer. In 1771 he went on an extended tour of the estate at Wynnstay and produced drawings, some of which were engraved as part of Views in North Wales published in 1776. He also toured Wales with Joseph Banks from 25th June to 16th August 1773. 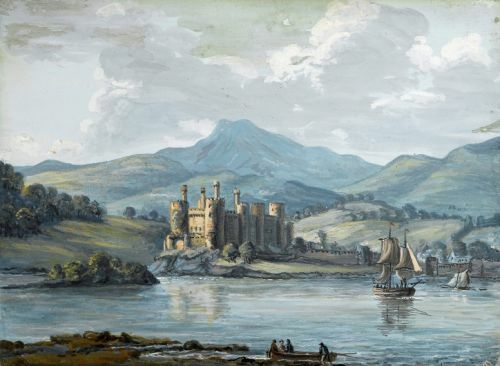 A slightly smaller view of Caernarvon Castle by Sandby dated 1773, taken from across the river Seiont is in the Walker Art Gallery, Liverpool. 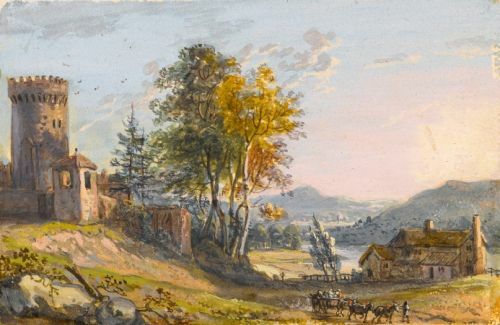 Luke Herrmann has suggested that the current work is the watercolour exhibited at the Royal Academy in 1775. 20.9 by 17.2 cm., 8 ¼ by 6 ¾ in. 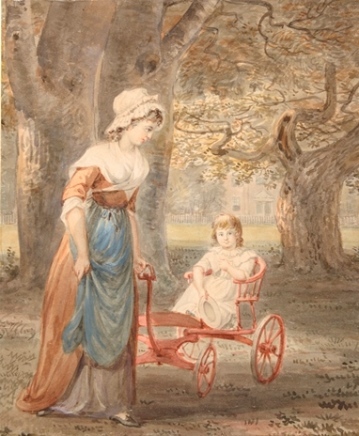 This shows the artist's granddaughter Augusta Sandby, and her nurse Sally Loman in Windsor Great Park. 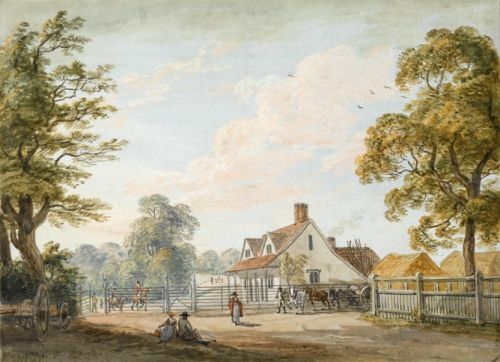 Sandby’s brother Thomas occupied the Deputy Ranger’s Lodge in the heart of Windsor Great Park during his tenure as Deputy Ranger from 1746 until 1798. The original building was remodelled in 1811-13 and then pulled down in 1830. It is now the site of Royal Lodge. A more finished view of the Lodge, also including Sandby family members, was sold at Christie’s on 14th July 1987, lot 139 and a smaller sketch dated 1789 was with Guy Peppiatt Fine Art in 2012 (see One Hundred Drawings and Watercolours, winter catalogue 2012-1013, no. 21a). 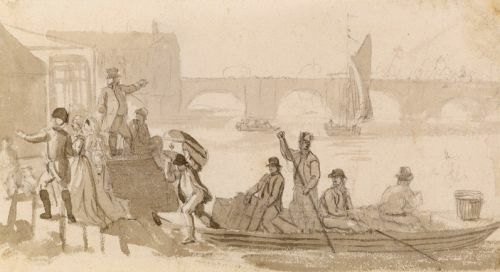 This is a view of the boatmen of the River Thames known as Watermen ferrying their passengers and goods across the river in a small boat called a wherry or skiff. They were an essential part of early London, transporting people and goods across the river via a series of public steps or stairs that gave access to the river. These public stairs became common in the 16th century when much of the Thames foreshore became enclosed behind private walls. These passengers are alighting at the Westminster Stairs, situated near Old Westminster Bridge which can be seen in the background. It was constructed in 1750, only the second permanent bridge to be built across the Thames. 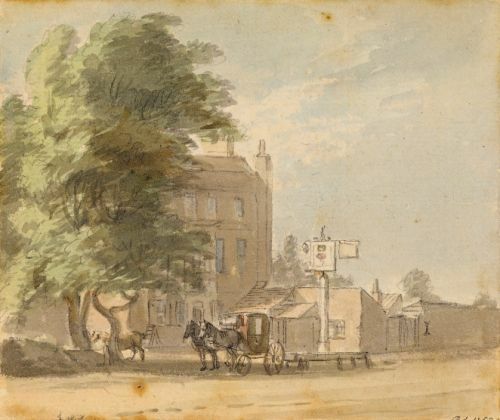 This watercolour dates from 1769, the year that Sandby was a foundation member of the Royal Academy. 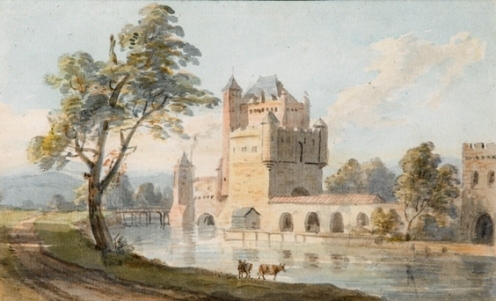 In the 1750s, Sandby had joined his brother Thomas at Windsor helping landscape the gardens and working on his first watercolours of the Castle and grounds. In 1768, he was appointed drawing master at the Royal Military Academy at Woolwich. 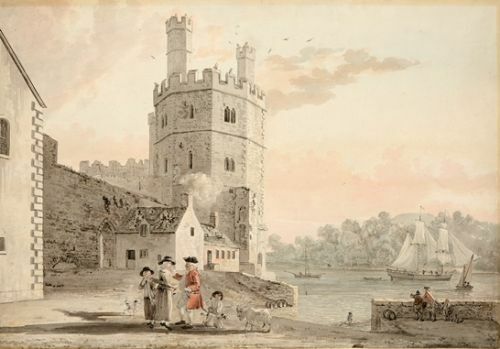 Traditionally described as view of Pembroke Castle, South Wales, this is unlikely as his first visit to Wales was not until 1772. This is a view of Conway Castle from the south-east looking up the estuary of the Conway river with the peninsula leading to Great Ormes Head to the right. Thomas Telford?s suspension bridge of 1826 now spans the estuary from near the castle. Conway Castle was one of the major castles built by the English on the Welsh coast in the 12th and 13th centuries. 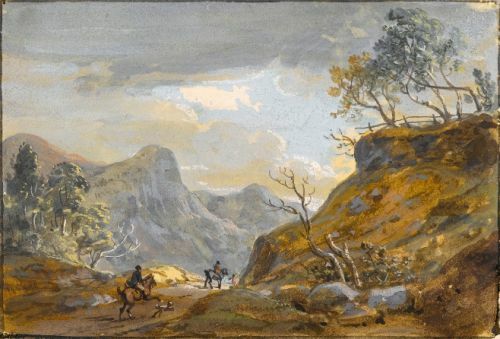 Sandby appears only to have visited Wales three times even though he exhibited Welsh views, and especially North Welsh views throughout his life. His first visit was in 1770 when he stayed at Wynnstay, the Denbighshire family seat of Sir Watkin Williams Wynn and he returned the following summer to accompany Sir Watkin on a six week tour of North Wales. His final visit was in 1773 when he toured South Wales with a group of naturalists. Sandby?s brother Thomas occupied the Deputy Ranger?s Lodge in the heart of Windsor Great Park during his tenure as Deputy Ranger from 1746 until 1798. The original building was remodelled in 1811-13 and then pulled down in 1830. It is now the site of Royal Lodge. A more finished view of the Lodge, also including Sandby family members, was sold at Christie?s on 14th July 1987, lot 139. By descent in the family of the present owner since the 1960s. 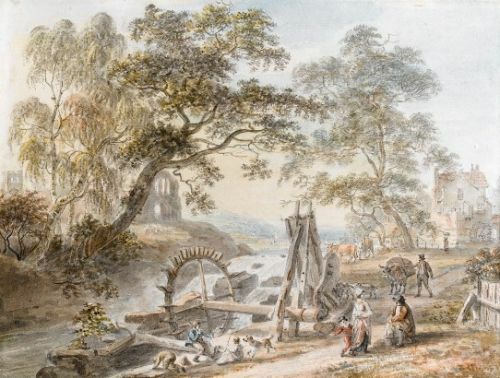 Stylistically this appears to be an early work in bodycolour by Sandby drawn in the tradition of the Italian landscape artist Marco Ricci whose work Sandby owned (for a similar work, see Luke Herrmann, Paul and Thomas Sandby, 1986, no. 5, p.83, ill.). 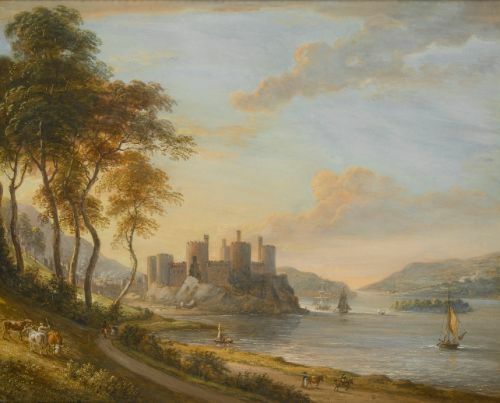 His first recorded trip to Wales was in 1770 as a guest of his patron Sir Watkin Williams-Wynn so the present work is likely to date from the early 1770s. 316 x 475 mm., 12 ½ x 18 ¾ in. 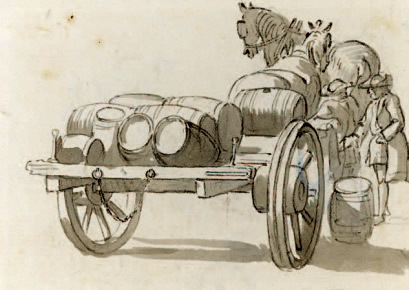 Sandby is often described as `the Father of English watercolour painting? as he was probably the first British artist in the eighteenth century to work commercially in the medium. 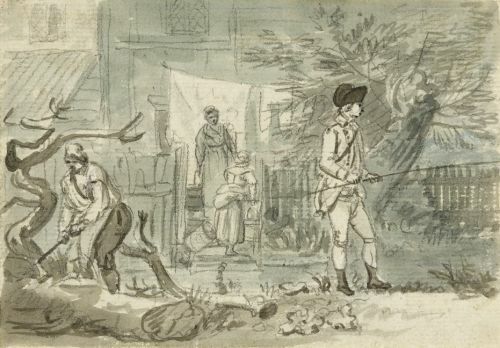 For more on the artist, see Paul Sandby ? Picturing Britain, Royal Academy exhibition catalogue, 2009.